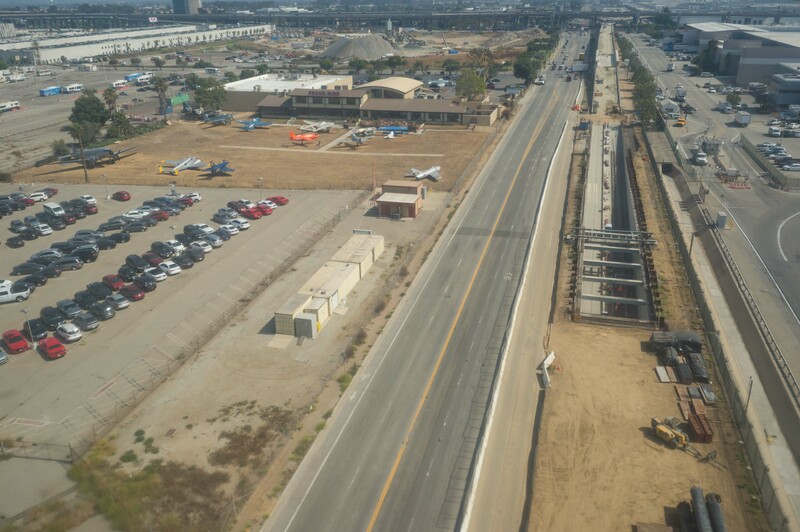 Looking south on Friday at the Crenshaw/LAX Line right-of-way and tracks emerging from the trench next to LAX’s south runway. The tracks will then climb a ramp that goes under the 105 freeway and toward the junction with the Green Line. Photo by Steve Hymon/Metro. Law enforcement will be able to respond to incidents more quickly from within their own local jurisdictions, improving response times to approximately five to six minutes from an average of 16 minutes. Increases in personnel throughout the system will result in a consistent 314 personnel over each 24-hour period. The Metro Board of Directors in February decided to add the LAPD and LBPD to the LASD. Our leaders, along with the rest of us, have been hemming, hawing, coasting and quarreling, and here we are, immobile and enraged. I mean New York. I also mean America. In the second article, Chicago Mayor Rahm Emanuel points out that while subway systems in New York and Washington are stuck in a moment they can’t get out of, the Chicago El (also a heavy rail) is 125 years old and running much more smoothly thanks to a series of upgrades that will increase capacity. Emanuel calls for expansion of several federal funding programs that would help transit agencies across the country maintain their systems. We concur. •The Regional Connector that will tie together the Blue, Expo and Gold Lines and allow more light rail trains to run to and through downtown L.A.
•The Red/Purple Line portal/turnback project at Union Station that will make it easier and faster to turn around subway trains — and allow service up to four minutes apart on both the Red and Purple Lines. •The Blue Line track/signal upgrade project that is creating more switches between tracks — making it easier for trains to get around problem areas. Maintenance also continues throughout the Metro Rail system. Measure M, too, will supply about $2.4 billion in the next 40 years to State of Good Repair projects, the idea being for Metro to have a pot of money for what Metro builds. That’s a revenue stream other transit agencies do not have. Dept. of Transportation-Related Movie Reviews: Saw “Baby Driver” the other night. Very entertaining summer movie that goes a little too conventional action movie toward the end. In the above article, Mayor Emanuel argues that mayors should be in charge of local transit systems as an accountability measure. FWIW, Mayor Eric Garcetti is a member of the 13-member Metro Board, has the ability to appoint three members and will be the Metro Board Chair this fiscal year (which runs through June 30, 2018). As for his second term, Garcetti told the LAT that creating affordable housing and getting homeless off the streets remain formidable challenges even as the city in many ways is booming. Related: Politico recently tabbed Garcetti as one of America’s 11 most interesting mayors and says he could be running for president in 2020. Reno? Better than it used to be but downtown is still too overwhelmed and dependent on rundown casinos. No disrespect to the mayor there, but Reno is about as interesting as my sock drawer. And it was interesting to me that Detroit, Louisville, Dayton and Pittsburgh are on the top 11 list. Attentive Source readers know that I was recently trapped in Porkopolis (Cincinnati) for two weeks (parents!) and was quite amazed at how the city and many of the ‘burbs have transformed themselves for the better in recent years. As manufacturing has declined across the Midwest and Rust Belt, a lot of once great cities were left to put the pieces back together. And they are. I’ve seen this over my past few visits to Cincy: a lot of young people not leaving when they grow up and a lot of young people coming to Cincy to live because of the quality of life, affordability (although not as affordable as it used to be) and job opportunities. So my bold prediction: as the big cities on the coasts get pricier, there will be a back to the Midwest movement in the coming decades as people seek more elbow room and a chance to rebuild a part of the U.S. of A well worth saving. Things to read whilst transiting: a very good Politico feature on how the powers-that-be in Cincinnati — with funding from corporate partners — created a nonprofit and supplied it with money to fix up the long neglected Over the Rhine part of downtown. Sounds like a model that could work in many places. The article also acknowledges some of the tricky aspects of Over the Rhine’s ongoing gentrification. Okay, now the sermon is really over. Amen to the first sermon. Is the Crenshaw line ahead of schedule? It’s on schedule — not ahead but on track for the forecasted fall 2019 opening. Welcome back, Steve. Could you comment on this line in Mayor Emanuel’s OpEd? “last month we broke ground on a factory that will manufacture the most modern fleet of rail cars in the country….” Given that Los Angeles is currently buying both light rail and heavy rail cars, how is he measuring “most modern”? Thanks, good to be back! My read on that line is that it’s a bit subjective, i.e the phrase “most modern.” Many transit agencies have rail cars on order and I’m sure they all think their cars are ‘modern.’ Chicago is purchasing its cars from a Chinese firm, which as part of the deal agreed to build an assembly facility in Chicago. The Chicago Tribune says 170 people will be employed, http://www.chicagotribune.com/business/ct-cta-new-railcar-plant-0316-biz-20170315-story.html. Dear Steve, before you blast Reno, or more importantly, Nevada in general, keep in mind that compared to Cali. it’s still far friendlier to businesses and individuals. A right to carry state, no state income tax, and a new Tesla battery factory worth billions of dollars! Before I retire and leave the Peoples Republic of Ca., I will pray for all of you. I hope also to meet you before then and share my credentials with you to prove I know a little more than is apparent from these short messages. Thanks for leaving. Don’t let the door hit you on the way out. All CA has to do is to put a toll booth on I-15 at the border and you can kiss those “low” tax rates goodbye. I see that the trench will be mainly COVERED. Will the top surface remain permanently barren? I would love to hear your take on the Honolulu Light rail fiasco. Completely elevated, its way over budget, behind schedule and constantly on the verge of total abandonment. It’s rather picturesque in rural areas where one sees a concrete ribbon crossing open fields. We in Las Angeles should live so long as to have the problems that the New York subways are having, not to mention very similar problems on the Long Island Rail Road and Metro North commuter railroads. I wonder if New York ever regrets tearing down FOUR late 1800s-early 1900s Els (on 2nd, 3rd, 6th, and 9th Avenues) in the late 1930s and late 1940s. Admittedly, they were replaced with new subways in the 1930s and led to the revitalization of the streets over which they operated. Now the subways that replaced them are jammed to the point that they cannot run on time due to overcrowding and longer station dwell times. To add to the misery, the L subway under the East River will be out of service for 18 months due to repairing damage caused by Hurricane Sandy. Fortunately; unlike in LA, there are parallel subway lines (M, J, Z, F, and 7, and even the A) that can take some of the overload. On the plus side, per http://www.amny.com/transit/new-mta-subway-cars-to-come-into-service-this-year-1.13516212, 300 new subway cars will be added over the next few years and another 1,000 by the early 2020s. In addition, New York is upgrading its subway to communications-based train control, which permits closer headways, the interval between trains, to increase system capacity. As for the four El routes in Manhattan, I wonder if they would be candidates for monorails similar to those in use in Japan (http://www.tokyo-monorail.co.jp/english/guidance/index.html). They would obviously not be as noisy and obtrusive as are the New York 3-track elevateds, complete with multilevel flying junctions, that still operate in the Bronx, Brooklyn, and Queens. Since dozens of route miles would be involved, perhaps a supplier could be found to partially fund such an endeavor as a way of penetrating the US market. any efforts to improve capacity and reliability in the existing system will be overshadowed by the fact that the Flower St. trunk line remains a critical chokepoint, and the drastic work needed to rectify this is utterly absent. On a related item, per https://la.curbed.com/2017/5/9/15595854/metro-blue-line-traffic-time-light-rail-synchronize, Long Beach Mayor and new Metro Boardmember Robert Garcia took to Twitter to announce that the long-awaited signal preemption system would arrive by this fall, shaving about 10 minutes off the train’s journey between Downtown LA and Downtown Long Beach. Now if only the LADOT would “get off its duff” and allow the same for the Expo and Blue Lines until they reach their respective rights-of-way and realize that moving trains that carry hundreds of passengers are just, if not not more, than moving autos with maybe one or two passengers. ON a related item, per https://la.curbed.com/2017/5/9/15595854/metro-blue-line-traffic-time-light-rail-synchronize, Long Beach Mayor and new Metro Board member Robert Garcia took to Twitter to announce that the long-awaited signal preemption system would arrive by this fall, shaving about 10 minutes off the train’s journey between Downtown LA and Downtown Long Beach. Back when the New York subways were first constructed, the builders thought that 4-car local and 6-car express stations would suffice for the foreseeable future, based upon the existing elevated lines. They were soon proven wrong, and thus 10-car local and express stations were soon constructed. As a result, most New York subway cars are in 4- and 5-car married sets, with relatively few singles. Thus most New York subway trains are 8- or 10-cars long, One exception is the 7-Line, which regularly has 11-car trains. Back in the Pacific Electric days, the 550-class (wooden) and 1200-class (steel) interurban cars regularly ran in 5-car trains on the Glendale-Burbank and Long Beach Lines, respectively. There were also 4-car trains of 1200s on the San Bernardino Line. LA Metro may be a long way from this, but in New York the Long Island Rail Road (LIRR) and Metro North frequently operate 8- and 10-car trains of electrical multiple units (EMUs). In fact, many LIRR station platforms are shorter than 10 cars, and thus passengers are instructed as to which cars to ride in order to platform and get off the train. On the non-electrified lines such as to Montauk on the tip of Long Island, there are even 12-car trains of double-deck commuter cars that have to double-stop at several stations to allow passengers to disembark from the two ends of the train. We should live so long as to see the day when Metrolink will be forced to do the same. I second the thoughts on the importance of maintenance. I’ve almost given up on the idea of taking the Gold Line anymore. Maybe I’m just on a run of bad luck, but it’s tough to go down to the platform after paying the fare just to turn around because it’s a 17 minute wait for the next train. Question: The post states future “four minute headways on both the Red and Purple Lines.” Does this mean four minutes between each Red Line and each Purple Line train, resulting in a train every 2 minutes? Or is it an improvement of just one minute per train from the current 5-min headways? two minutes between Union Station and Wilshire/Vermont, where the lines split). To be technica,. “switches” refers only to the movable parts. i.e., the points, of a “turnout.” This is true for both model and full-sized railroads. In model railroads, we never confuse switches and turnouts. For example. see http://www.metrolinktrains.com/pdfs/EngineeringConstruction/EngineeringStandards/ES2000_Turnouts_No_24.pdf. The number of a turnout which, in this example is 24, represents the ratio of divergence per length as measured at the frog. A rule of thumb is that the rated speed of a switch (in miles per hour) is twice the numerical rating. Thus, for a Number 24 turnout, the rated speed for a diverging train through an open turnout would be 48 mph, Trains passing straight though a closed turnout, irrespective of turnout number, would be unaffected by passing over a turnout. The frog, also known as the common crossing (or V-rail in Australian terminology), refers to the crossing point of two rails, such as where the outer rail of the diverging track crosses the opposing rail of the straight track. See https://en.wikipedia.org/wiki/Railroad_switch for all you will ever need to know about railroad turnouts.